In 1099, the victorious Crusaders captured Jerusalem and then embarked on an epic frenzy of slaughter and destruction. Now, a century later, the seeds watered by that bloody harvest finally blossom. A madman stalks the nights. An ancient vampire stirs in his slumber. A holy spring weeps tears of blood. Unless someone can learn Jerusalem's darkest secret, the slaughter will begin anew. 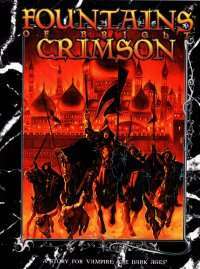 Fountains of Bright Crimson is an adventure chronicle for Vampire: The Dark AgesÃƒÆ’Ã¢â‚¬Å¡Ã‚Â©. It explores the greatest mystery and tragedy of Jerusalem's Cainite history - the Weeks of Blood. Now the hideous truth behind the slaughter of innocents can be told - if you are brave enough to know the answers.